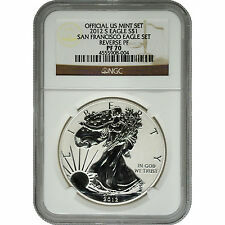 2012 W PROOF SILVER EAGLE NGC PF70 ULTRA CAMEO EDGEVIEW ...SEE MY OTHERS! 2012 W PROOF SILVER EAGLE NGC PF70 ULTRA CAMEO RARE MERCANTI SIGNED! 1 product rating - 2012 W PROOF SILVER EAGLE NGC PF70 ULTRA CAMEO RARE MERCANTI SIGNED! This page was last updated: 18-Apr 08:44. Number of bids and bid amounts may be slightly out of date. See each listing for international shipping options and costs.